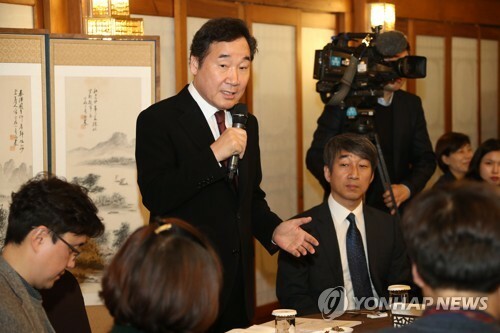 SEOUL, Jan. 16 (Yonhap) — Shutting down cryptocurrency exchanges is impossible without approval from the National Assembly because new legislation would be required to do so, Prime Minister Lee Nak-yon said Tuesday. Virtual currency regulations have been one of the hottest issues in South Korea since the justice minister said last week that the government is working on legislation that includes a shutdown of all exchanges. The remark sent cryptocurrency prices tumbling and sparked angry reactions from investors. As market confusion and investor anger deepened, the presidential office Cheong Wa Dae stepped in hours later, saying no decision has been made on the proposed shutdown. But the perceived flip-flop led to criticism that the government is handling the matter in an amateurish manner. On Tuesday, Lee defended the government, saying the justice minister’s remark was misunderstood. The announcement suggests that a shutdown is not likely in the near future. The government has been struggling to bring cryptocurrency speculation under control with a series of measures, including a regulation requiring real-name transactions in virtual currency trading, but the overheated market has shown few signs of cooling.